Hamiltonian Gallery is pleased to present two new bodies of work by artists Kyle Bauer and Patrick Harkin. The exhibitions will open with a reception on Saturday, February 24 from 7 - 9 pm; both artists will be in attendance. In Kyle Bauer’s newest body of work, “At Hand”, the artist strips away the facades and colors of his oeuvre to date, revealing the surfaces and tensions that have always been at the core of his artistic practice. Working almost exclusively in meticulously re-imagined plywood, the artist creates an environment that communicates a sense of foreboding. Taking his cues from the silence, anticipation and mounting tension that accompany the act of hunting, Bauer forces the viewer to physically navigate sculpted thickets of vines and cat-tails, only to encounter monumental pieces that aggressively assert their presence. “At Hand” marks a new phase of creative experimentation for Bauer; his vulnerable sculptures lay bare a devotion to seamless craftsmanship and the desire to create a new meaning out of materials with humble origins. In “Harm Reduction”, Patrick Harkin creates immersive environments in which the tangible and the virtual each have an insistent presence. 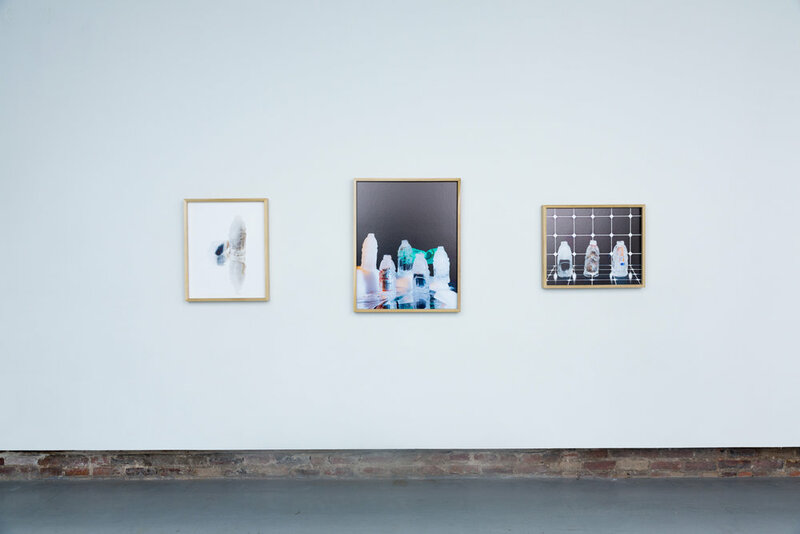 All of the pieces in Harkin’s exhibition - which include photography, sculpture, video and sound - are interconnected in a cyclical feedback loop. The exhibition’s main motifs are found objects that are repeated in multiple formats and iterations: an image of a frozen block of ice in the shape of a Gatorade bottle is placed in dialog with videos and objects that allude to the same form in both permanent or ephemeral states. Adding to the atmosphere throughout the space is a sonic component that is created when the light emitted by pendant lamps is recycled via solar panels and returned as a pulsating soundscape. 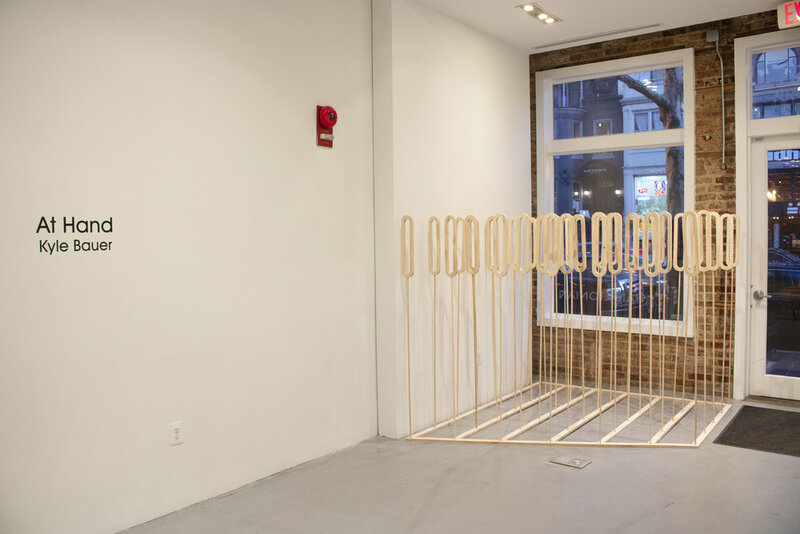 The shared relationships between the objects in “Harm Reduction” hover between the poetic and the comedic, all while touching on the issues of rising sea levels and conspicuous consumption. Kyle Bauer (b. 1985, Salem, Illinois) moved to Baltimore after earning his MFA from Louisiana State University in 2011. Since 2012, he has been the conservation technician of prints, drawings, and photographs at the Baltimore Museum of Art. Bauer. Recent solo exhibitions include “Chatter” at Loyola University, Baltimore, MD (2017), “Cardinal” at the Delaware Contemporary, Wilmington, DE (2017), “The Clay Studio National”, Philadelphia, PA (2016), and “Fairway” at Flashpoint Gallery, Washington, DC (2015). Bauer is a 2017 and 2015 Maryland State Arts Council Individual Artist recipient, and his work was recently gifted to the Louisiana State University Museum of Art. Bauer lives and works in Baltimore, MD. Patrick Harkin (b. 1990, Scott Air Force Base, Illinois) makes work that addresses the ties between images, materiality, and consumerism in order to explore the human condition under image mediated culture. He currently teaches photography at Virginia Commonwealth University. Harkin holds a BFA from the University of Florida (2015) and an MFA from Virginia Commonwealth University (2017). Recent exhibitions of his work have taken place at Virginia’s Museum of Contemporary Art (Virginia Beach, VA), VALET (Richmond, VA), Florida Museum of Photographic Arts (Tampa, FL) and Gallery Protocol (Gainesville, FL).